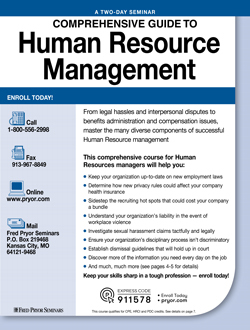 Two days of comprehensive training in the most difficult job of all — Human Resources. As a Human Resources professional, you're on the front line of your organization every day — fighting to stay focused on a moving target. It seems like employment laws are continually being created or revised. Benefits administration is a confusing challenge with unending questions from employees and constant roadblocks by the insurance companies. Then there are the hassles of record keeping, hiring, disciplinary action, documentation — the list is endless and so are the pressures. Each day, when you come in to work, you may wonder, "Will this be the day I make a mistake that lands my company in legal hot water? Will this be the day a misunderstanding costs us hundreds of thousands of dollars?" It's a lot of responsibility, and you feel the weight of every ounce. More than anyone, you know how helpful this seminar could be. In this comprehensive training, we'll cover the many different aspects of your job and arm you with the skills you need to succeed in the demanding field of Human Resources. You'll come away with a wealth of practical tips, sensible guidelines and valuable techniques to meet the real-life challenges you face every day. The employee who doesn't want the transfer — can your company legally enforce it? Military service and active duty — can they be considered family leave? Is it ever illegal for an employee to hold a second job while on leave from your company? Is your employee handbook consistent with the latest changes in employment law? The real meaning of "reasonable accommodation"
Reverse discrimination — could your organization be found guilty? Three things you can do to make your company one of the "top places to work"
The 360 degree feedback and performance appraisals — good or bad? Defamation of character — is your company liable for comments made by an employee?